Just found this on 0.7.0 patchnotes? I don't know if im jumping the gun here, but that looks like a Musashi coming out on 0.7.0, which is, like, tomorrow? That's cool, once I get over the shock ill be uber hyped. That's the removal of the Missouri, it doest strictly say Musashi will be added at the same time as Missouri is removed. Considering she is finalized and ready for release. No, it says it comes out tomorrow and Missouri will be removed in 7.2. Both will be in the tech tree for two patches concurrently, and then just Musashi after that. Now's your chance to pick up the US tier IX USS Missouri for in-game Free XP -- she's departing on release of Update 0.7.2 as we roll out Musashi, the new tier IX battleship that can be acquired with Free XP. Emphasis mine, which would indicate Musashi comes out just as Mo leaves. I'm still reading it as Musashi coming tomorrow because it'd be dumb to announce it like that otherwise, but they then bungled the translation with ambiguity. Well that was a massive buzzkill. I guess it did seem like too much of a good thing. I'll be honest with you. After a few of the replies to my post, rereading it, it certainly has a lot of ambiguity. Plus, putting something like that on a current patch note for something in a future patch means that it is open to a lot of confusion. WG really needs to fix ambiguity/bad translation and errors of this sort. Happens way too much. Look's like that is just confirming the price of 750k FXP. This is correct and I am licking my lips....Mmuuuuuaaahhhhhhhaaaaa. Got to say, the way it reads it absolutely sounds like Musashi is coming out tomorrow and until 0.7.2 Musashi and MO will both be for sale. Might want to edit that to be more clear. How about you let us buy Roma to make up for it? WG, admit to a mistake and actually fix it?? Are you crazy? Damn how many doubloons would that be??? Thank you, both that would be a divorce causing amount So no Musashi for me for a while. Sorry for any confusion. It is in fact coming out tomorrow. My apologies for any confusion this may have caused. Nope, unfortunately Musashi is not coming out to tomorrow. 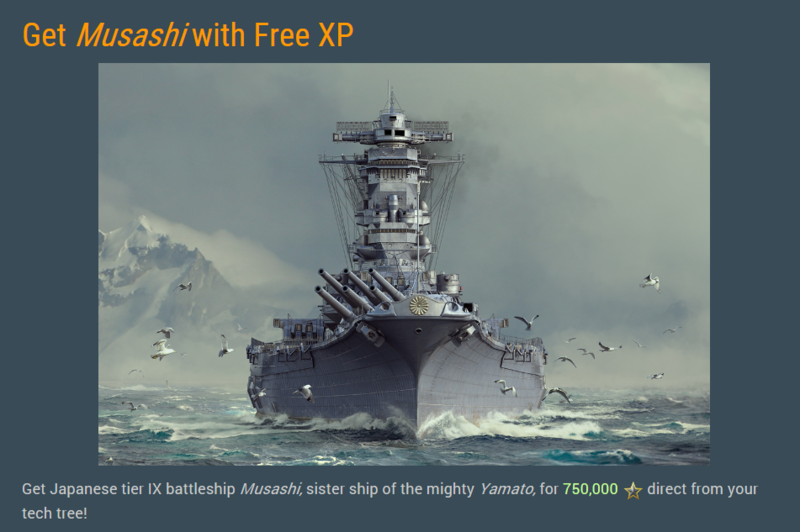 "... on release of Update 0.7.2 as we roll out Musashi, the new tier IX battleship that can be acquired with Free XP. " They really need to fix that announcement then because when you read the announcement it says NEW CONTENT, not Upcoming Content. New Content when attached to patch notes, to me at least means new content for that patch and not everyone reads the forums to find out that "New Content" doesn't mean no content for this patch. Basically there are going to be alot of upset people out there he are expecting the Musashi because it sure as heck looks like the Musashi will be available for Free XP with the update to 7.0. So I trust that the Mighty Mo will still be purchaseable until 7.2 or do I have to run out and buy doubloons now? Never has there been a better time to be an HE spammer. My Conqueror and Henri are on stand bye. Thank you for proving our point about confusion and ambiguous wording and translation errors from WG. Also, why did you delete your posts rather than editing out the original misinformation with strike through and a correction at the bottom? Now with missing posts and people referring to those missing posts you have continued to add to the confusion.